my good friend christine and i (and all five kiddos!) 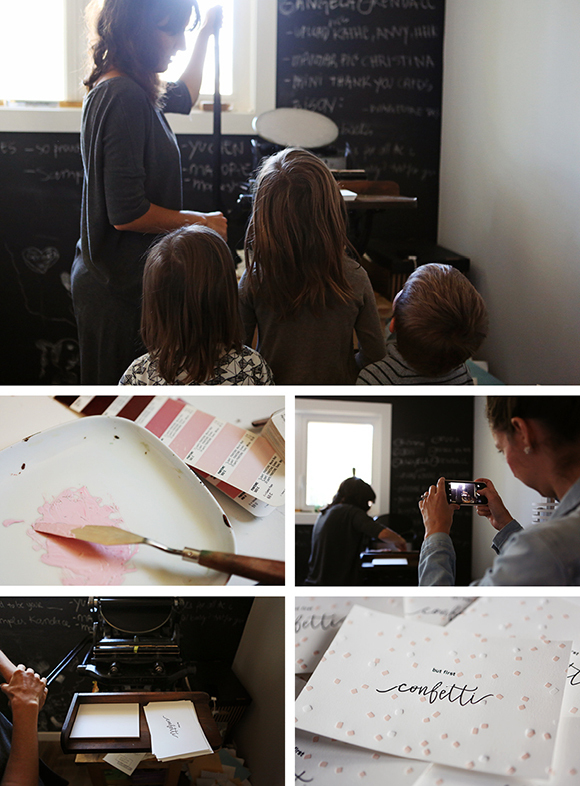 were lucky enough to spend a morning in the studio with local talent uppercase press collaborating for a brand new venture we have in the works. you’ll be hearing much more about MAKESHOP. the social co. in the coming days but for now, head over to our brand new instagram account to enter to win one of these letterpressed but first, confetti prints! 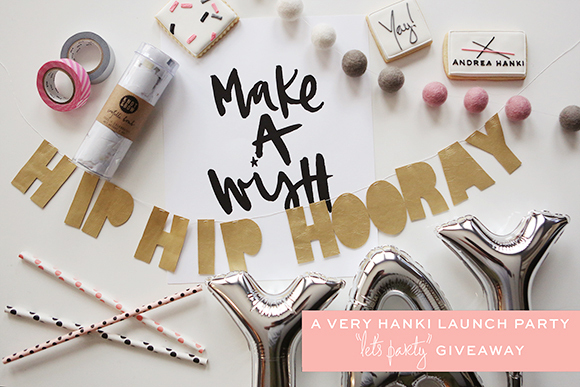 today’s giveaway is a curated collection of some of awesome goodies to throw yourself your very own personal party (because, why not?!) from some awesome canadian small businesses and designers. it’s been so awesome celebrating this week with all of you and what better way to wrap up this launch party than with an actual one! haha, so obviously that isn’t the case, but i was hanging out at the library this morning, and if you’ve followed our adventures here for any period of time, you know how big of a role reading and books play in our lives here in hankiland. that said, when i was presented with the opportunity to support early literacy in our city, i was definitely not going to say no. the welcome baby program is a program put on by our local libraries here in edmonton that helps to provide the gift of reading to each and every baby born in our city, and this weekend the team behind apricity is putting on a fundraiser to help support the cause. the once upon a springtime event is an evening of sweet treats, storytelling, and silent auctions to raise funds for the welcome baby program and i’m super excited to be giving away tickets to sunday night’s event. up for grabs are two tickets, courtesy of the apricity team to sunday night’s once upon a springtime event at the jasper place library (my personal favourite branch). entering is super easy — just leave a comment below sharing your favourite children’s book and you are in the draw! winner will be drawn thursday, march 19.
today’s giveaway is a curated collection of some of my favourite things for me (and you!) from some awesome canadian small businesses and designers. so often as women, we focus most of our attention on our kiddos/partners/anybody but ourselves, and this giveaway is an opportunity to take a little bit of time to celebrate you. when hanna andersson contacted us shortly before summer vacation began, i jumped at the chance to test drive some of their pajamas for the kiddos. with all of the camping and cabin trips we have planned for this summer, a couple of pairs of nice cozy pjs were on my shopping list anyway, so the timing was perfect! super soft, striped and available in both full length and shortie style for the big kids, and in zip up or snap up sleepers for the wee ones, they did not disappoint. lila and cole pretty much lived in them from the moment they got out of the lake in the evenings until they splashed back in each morning. contest closes sunday, july 27! after looking for an initial necklace for the past few years, i finally stumbled across the perfect one a couple of weeks ago, just in time to treat myself to a little birthday/mother’s day gift. copper, geometric and locally made, i fell in love pretty much instantly. and now you can have one too! cheryl from cloud & lolly has offered up a custom copper initial necklace for one of you! want to celebrate your children? a loved one? yourself? choose a few letters and cheryl will hand stamp them, along with a teeny heart, in copper metal clay, creating a one of a kind keepsake for you to wear around your neck. as always, there are a few ways to enter, and you’ll have to leave a separate comment for each entry (you will have left three comments once you’ve entered all three ways). contest closes sunday, may 25.
lila’s christmas list this year included two items: 1) a book and 2) a doll, preferably one with glasses who has clothes that she can take on and off. the book was easy — i already had a stash tucked away for her — but the doll with glasses was a bit trickier. when i finally came across one i knew she would love (complete with glasses, fringed booties, reversible poncho, tiny skirt and secret tattoo), less than two weeks before the holiday, i knew i was cutting it close; but the lovely april from riley construction did everything she possibly could to ensure my little lady could have her own bespectacled little friend under our tree. contest closes friday, january 10.
anyone who’s been following this little blog for a while probably knows we’re pretty big fans of adventuring around here, so when i came across this screen printed map on etsy a while back, i knew our home had to have one. now, thanks to colleen from walsh-walsh & son, one of you can have the map of your choice (and there are lots of choices!) for your home as well. as always, there are a few ways to enter, and you’ll have to leave a separate comment for each entry (three comments if you enter all three ways). good luck, happy adventuring, and thanks again to walsh-walsh & son for this giveaway! as you may have seen this weekend, i love our custom family portrait so much i couldn’t wait the extra two days to share it with you all and had to share it on saturday. and now it’s your turn to enter to win one of your own of the people you love. 1. leave a comment below with who you’d include in your portrait and why they’re awesome. 2. ‘favourite’ the uh oh my deer shop on etsy, and comment to let me know. 3. and lastly, because i likely would never have stumbled upon kate’s work without instagram, follow me on instagram, and leave one last comment (share your username if you’d like!) for one more entry. contest closes friday, april 12th. imagine you’re a four year old that loves colouring… now imagine that you get a package in the mail one day with an activity book, scribbler, pencil crayons and pencils with your name printed all over everything. mind blown, am i right?! lila was just a little bit thrilled to receive this custom activity pack from the lovely folks at stuck on you and spent a good portion the weekend getting her doodle on. not only are these goodies all personalized, but the illustrations are actually really cute too. we had a tough time choosing between the woodlands and arrr zap themes, but the little fox won lila over in the end. we also received some mini name labels that should be great for marking all of lila’s supplies when she starts kindergarten in the fall. now onto the best part, stuck on you has offered up some twenty dollar gift vouchers so four of you can also get your hands on some cute personalized goodies (seriously, this company has something for everyone: labels, placemats, aprons, puzzles… the list goes on). to enter, head over and like the stuck on you facebook page (don’t forget to grab the free shipping coupon while you’re there), and then come back here and leave a comment letting me know what you’d choose from the site if you win. contest closes friday, march 22.
best of luck, and thanks to stuck on you for the awesome goodies! after eating pretty much anything and everything put on his plate for the last five months or so, cole has decided that yogurt is the only food group worth touching for the past couple of weeks. we are, of course, encouraging him to get back to eating all of the foods he previously enjoyed, but on those occasions that only yogurt will do, these reusable snack containers from squishy snak pak have been incredibly convenient for yogurt on the go. the lovely michelle from squishy snak pak is giving away a set of two reusable snack containers (perfect for yogurt, applesauce and any other sort of puree) to one of you 🙂 these would be an awesome stocking stuffer for the little one, or new parent, on your holiday gift list! contest closes friday december 14.
best of luck (and yay for awesome canadian businesses)! it’s party season in pinksugarland (we had a little halloween bash yesterday and lila and cole will both be celebrating birthdays in the next month!) which seems like the perfect time for an awesome giveaway from the confetti and sparkle party shop!!! cindy from confetti and sparkle is giving away a custom ‘party in a box’ to one lucky pinksugarland reader. one of you will take home a set of paper drinking straws, some treat bags, stickers and a 36″ balloon. yay! 3) tell me something about a party coming up in your family!! contest closes friday, november 2.
it’s monday, it’s fall, and it’s been far too long since the last giveaway, so let’s just get to it! you may have noticed the ridiculously cute neckwear my kiddos were sporting yesterday… irina from purl lamb was kind enough to send a couple of custom cowls (cole’s is bandana style — so awesome!) for us this fall and is giving one away to a lucky reader as well! first, head over and like the purl lamb facebook page (and leave a comment here letting me know you’ve done so). second, leave another comment below telling me something (anything!) you are looking forward to this fall. contest closes friday october 19.
big thanks to purl lamb for the generosity (and mad knitting skills). good luck! as seen yesterday, this little fishing set is the newest hit toy around these parts. and today, the awesome people over at locally rooted have agreed to give one away to one of you! and finally, go sign up for email updates on the locally rooted site (and leave yet another comment) to get a third chance to win! good luck, and thanks again to locally rooted for sponsoring this giveaway! i completely forgot to upload this before we headed out of town — sorry for the wait! yay for meghann who won her choice of string headband from thief & bandit! and i so loved reading all of the summer fun responses that were posted. thank you all for sharing — you guys are awesome! we’re a wee bit smitten with all things thief & bandit these days (as seen here and here and as soon as order number two arrives, will be seen adorning my neck and wrist as well!) so i’m more than a little bit excited to announce that thief & bandit kids are giving away one of their ridiculously cute string headbands to one of you! yay! to enter, leave a comment below letting me know a favourite item from either the kids’ or adults’ shop. and for an extra entry, comment again sharing something you’re excited to do this summer (or winter if you’re on the other side of the world) with your family! contest closes friday june 1.
good luck, and thanks to thief & bandit for designing such awesome stuff! an awesome scarf that doubles as a nursing cover? yes please! i’ve been wearing one of these almost every time i leave the house these days, and i’m not ashamed to admit i’ll likely continue wearing them long after i finish breastfeeding. luckily for you guys, the lovely maria behind coverboo couture has agreed to give away one of her gorgeous (and functional!) scarves to a pinksugarland reader! and if you want a heads up on when new fabrics and patterns will be in stock (they go very quickly! ), you can follow maria on twitter or like the coverboo facebook page! contest closes friday march 23.